Your dad has been there every step of the way. He taught you to fish, to ride a bike, and to enjoy the great outdoors. Naturally he deserves a gift fit for a king. Give him a gift he’ll be proud to show off— something he’ll use for years to come. We’ve scoured the OutdoorCooking.com website to find the very best gifts for dad this Father’s Day. If you’re dad is a do it yourself kind of man then he’ll enjoy making his own jerky. This smaller junior jerky gun will be perfect for those dads just starting out. The simplistic design and 1-pound capacity jerky gun makes it easy to handle. He’ll be making homemade jerky, snack sticks, and sausage links in no time. The Sequoia Fire Pit can be taken anywhere with the included carry bag. 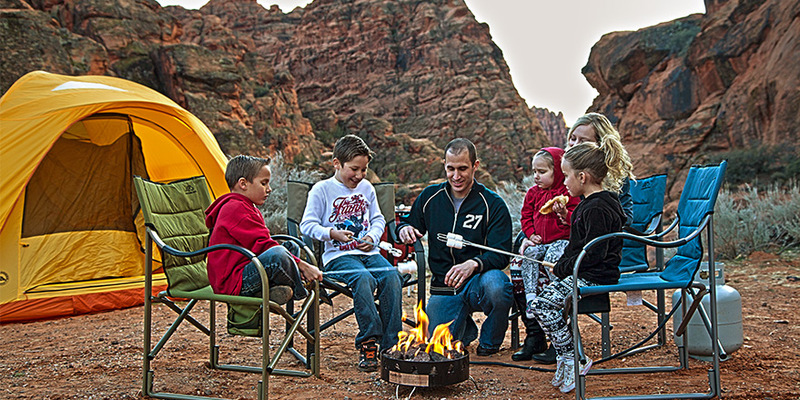 Make the most of family night by roasting marshmallows or hot dogs over the heat dispersing lava rocks. Just hook up your propane tank and let the night radiate in both warmth and laughter. We can’t get enough of the convenient Sherpa Camp Table. Not only does it pack nicely, but your dad gets extra storage space with the four removable storage bags/bins. Take it to the campsite, bring it tailgating, or set it up in dad’s work shop—either way he will love the versatility. In true royal fashion the King’s Camo Stryker 200 is the perfect gift for the dad who loves the outdoors. This compact stove runs conveniently on both propane and isobutane fuel sources. He’ll haul around a mere 19.4-ounces and be able to cook up to 1.3-liters. If your dad loves backpacking, wants to save on space, and still eat like a king—get the King’s Camo Stryker 200 Stove. We don’t know a dad who doesn’t value a good nights sleep. Let’s keep it that way—even when he camps. The Double ZZ offers a 4-inch thick cloud-like air mattress for maximum comfort. He’ll be most impressed with how well he fits on the 25 x 78-inch mattress. With a speedy inflation/deflation time, dad will spend more time sleeping. It’s no wonder that Big Agnes takes sleeping seriously. The Weston food dehydrator line is a versatile gift that dad will love to add to his fleet. Easily make healthy snacks like dried fruits, banana chips, fruit-roll ups, and jerky. He’ll be taking these snacks on his next hunting, camping, or road trip. The light-weight counter top design allows for an easy store. Plus, clean up is essentially non-existent. Get the most out of your money by getting dad the Big Gas Grill 2X. The detachable legs allow for him to bring it on his next adventure. Whether he’s grilling burgers cheering for his favorite team or whipping up a mean breakfast at the campground—the Big Gas Grill is his new Big Gas best friend. Spend some quality time outdoors with dad this Father’s Day. Sleep comfortably in the durable—yet spacious—Big Agnes Big House Tent. Just how big is the Big House? The living space is 57-square feet with a height of 68-inches. While the tent can be used for three seasons the memories will last a life time. All dads want a trusty smoker for their back patio. Give dad the sleek Bronze SmokePro SG Pellet Grill. New Slide and Grill Technology allows for dad to diversify his BBQ style by cooking with either direct or indirect heat flames. The larger hopper capacity means less time topping it off with pellets and more time cooking. Add the BBQ Sear Box to help him extend the menu or get him a bag of his favorite pellets. This might be the tastiest gift on the list! Which product is your dad getting this Father’s Day? Let us know in the comment section below!